This was a paper Carr and Hesse presented at the International Symposium on the Emergence of the Smart City, Luxembourg, March 6, 2019. We want to address a discrepancy; that is, the discrepancy between processes and practices of technological development on one hand and the production processes of urban change and urban problems on the other. There’s a gap here, and we can illustrate it with the case of the so called "Google City"(1). The scholarly literature on digital cities is quite clear that there are externalities, uncertainties and risks associated with the hype around, and the rash introduction of, 'smartness'. To us, an old saying comes to mind: Don't put the wagon before the horse. Obviously, digitization and technology have revolutionized geography in many ways. This is nothing new. Roughly twenty years ago, after the rise of the Internet, some, such as MIT's Bill Mitchell (1995), speculated that it and other ITs would eradicate space into the ‘City of Bits’. However, even back then statements like these didn't go uncriticised by those who pointed at the inherent technological determinism in such statements, and/or exposed that there is a complex relationship between urban development, urban planning, and technological innovation. And further, that this relationship was neither new, nor trivial such that tech, itself, would automatically and necessarily be productive, beneficial, and central to cities. What has changed is the proliferation of digital technologies and their applications. We agree with Ash et al. (2016) that geography has experienced a ‘digital turn’ where urban geography now produced by, through and of digitization. And, while digitalization of urbanity has provided benefits, it has also come sidelong a number of unsolved problems. First, behind the production of big data, algorithms, and digital design, there are certain epistemologies – ways of knowing. Data is not value-free. Rather, data is an end product of political and associated methods of framing that structure the production of data. So, now that we "live in a present characterized by a […] diverse array of spatially-enabled digital devices, platforms, applications and services," (Ash et al. 2016: 28), we can interrogate how these processes and algorithms are informed by socio-economic inequalities, because the risk is that new technologies will simply reproduce them. Second, the circulation of data around the globe invokes questions about who owns and regulates them when stored and processed in remote geographic locations. This uncertainty, is also not new. But scholars are more and more concerned about the implications of data-driven markets, algorithmic capitalism, and algorithmic governance (Bilić 2018; Fuchs 2017; Larsson 2018; Zuboff 2019). There is the risk that end-users, citizens, or residents, will lose ownership, sovereignty and democratic control of data that is produced. Or worse, that they will form an underclass, whose behavioural data is simply a low-priced resource to be extracted in the interests of '#SurveillanceCapitalism' – referring here to the revolution in capital accumulation that Google, itself, invented (Zuboff, 2019). Third, the smart-city agenda is heavily pushed by tech companies who see digitizing urban environments as a burgeoning market for their products. Kitchin (2015) sees a number of undesirable externalities on this point alone: a) the commodification of public services, as they are administered by and for private profit; b) technological lock-in effects that can render the city less resilient against bugs, viruses, crashes, and hacks, which can also be difficult to reverse; and (c) digitalization endorses certain processes of standardization that overlook the specificities of places, fixing municipal administrations to narrowly defined technocratic modes of digital governance. Question: Are tech companies are aware of these downsides, because they are certainly never featured in marketing campaigns. We also wonder if this is something society, in fact, needs or even wants. How will the outcomes be managed, and by who? Fourth, urban policies and practices are not one-size-fits-all, ready-for-wear, templates that can simply be transferred from one place to another. It is not reasonable to expect that a practice developed in one context will be successful in another. This is the message from the urban policy mobilities literature (Baker and Temenos 2015; Carr 2014): Local context does matter. One smart city that is receiving widespread attention at the moment is Alphabet Inc.’s (formerly known as Google) project in Toronto. In 2017, Sidewalk Labs – a subsidiary of Alphabet Inc. – won the international competition to develop Quayside, a derelict piece of land on Lake Ontario. This grabbed media attention far and wide. The tech community drooled (see Marshall, 2017): "Alphabet joins the grand tradition of master-planned cities, places built from near-nothing with big social goals in mind," WIRED magazine announced. But others wondered why an advertising company running annual revenues of 110 billion USD (Alphabet, 2017: 5) was getting into urban development. It's weird. And in fact, our research has found that there is a clear discrepancy between the optimism delivered by Sidewalk and the uncertainties raised by a rather diverse set of actors from the general public. While the exact plan is yet to be revealed; Sidewalk maintains that jointly with the government owned, Waterfront Toronto, it will develop Quayside into the best smart city ever (see Sidewalk Toronto, 2019). Through its widely advertised but hardly explained “single digital platform” (SDP), Sidewalk will deliver on the three 'E's of sustainability. Quayside will be environmental with climate positive passive buildings, which will be flexible and multi-purpose. Garbage will be automatically removed, smart cars will ferry people about, and sensors will monitor air pollution. Quayside will be social as development will be participatory, harnessing diverse inputs. To this end, Sidewalk Labs invested 50 million USD (think about that) in public outreach, orchestrating Public Roundtables, Public Talks, Neighbourhood Meetings, Workshops, Design Jams, Civic Labs, Kids Camps: This is termed interacting with the neighbourhood. Quayside will aid in urban economic development, by reducing the costs of government and ensuring that housing is affordable, reversing the trend of gentrification that is otherwise sweeping the city. That's the hype. 1) Jim Balsillie, founder of Blackberry, and Balsillie School of International Affairs at U Waterloo & Laurier U. He published a scathing piece in a Canadian national daily, where the title said it all, "Sidewalk Toronto has only one beneficiary, and it is not Toronto;"
2) Prof. Ann Cavoukian, Privacy by Design Centre of Excellence at Ryerson U and Former Information and Privacy Commissioner of Ontario. She was long touted as Sidewalk's on-board, Canadian-bred, privacy specialist, but she resigned after she discovered that privacy would not, could not, be guaranteed. 3) Prof. Mariana Valverde and Alexandra Flynn Sociolegal Studies at University of Toronto. They unpacked the exact legal, institutional and geo-spatial arrangement of Alphabet Inc., Google LLC, Sidewalk Labs and Sidewalk Toronto, revealing suspicious international financial circuits. 4) Saadia Muzaffar, Her resignation letter to the Digital Strategy Advisory Panel of Waterfront Toronto is a must read, but here is a quote: "There is nothing innovative about city-building that disenfranchises its residents … and robs valuable earnings out of public budgets, or commits scarce public funds to ... technology that city leadership has not even declared a need for." 5) Bonnie Lysyk, Ontario Auditor General. She has already fired a number of officials at Waterfront Toronto for apparent mismanagement. These are just a handfull of the region's most talented experts in the field, who have raised serious reservations, about which Sidewalk remains silent. So, it's political now. But, it also reveals the central risk: that no one has any idea how to regulate or manage this development. Rest assured, too, the story is not over. The Auditor General's 'blow' might simply be indicative of partisan politics – between the Trudeau government that is said to have had a direct hand in the development and the Conservatives who control the provincial and city governments. Quayside is being sold to the world as the next generation digital city. But what can it offer to scholarly debates and to local Luxembourgish policy? First, Quayside brings into focus that Alphabet Inc. is entering urban policy as another developer on the field: Alphabet Inc. is getting into territory, and that so far the neoliberal logics of market-driven land use, speculation and investment are unchanged. However, gaps in the discourse – the silence – related to urban and data governance suggest that there are some hidden dimensions, underlying logics, 'immense asymmetries of knowledge' (Zuboff on Talking Politics 2019) and quite likely even new dimensions of geography produced for the digital, and not the other way around. Second, as Kitchin (2015) argued, smart city agendas entail a certain international circulation of knowledge followed by the application of standardized instruments that don't match the specificity of place. Sidewalk, with its palate or ready-made solutions to problems that haven't been identified yet, is an example of this. This lesson of policy mobility is particularly relevant for Luxembourg, which is demonstrably a rather specific context. the vast political majority in this country believes that things should continue to grow … The ramifications of this pathway are viewed second order problems, simply in need of a technical fix. The question is: How the smart city be beneficial in this situation, with this set of problems. What will smart city development add, beyond simply opening up a new field of business? Thus, we argue: Let’s be careful not to put the cart in front of the horse and start with an open discussion about cities first, and smartness second. After an awareness of the critical elements of Luxembourg local development is developed, one could then explore the nexus of cities and smartness, how they could be brought into productive conversation, what the cost and benefits would be, and so forth. …because smartness isn't a free lunch (! ); It won't automatically be good, and it won’t automatically improve cities and urban life. (1) Harvard Professor Shoshana Zuboff (2019), on Talking Politics, makes the point that Google City is not the correct name: "...So now what we see is: Google replaces government; computation replaces politics; no one is asking the citizens what they want. This is the citizen's city. This is the people of Toronto's city. This is not the Google City." And she went on to say that "there are people in Toronto right now fighting this fight, saying these things, and their public officials are not listening to them, because somehow they are living in a fantasy world where they equate Google with progress." Acknowledgements: We want to thank the following for their great feedback and support here in the urban studies group of the Institute of Geography and Spatial Planning and at the CITY Institute of York University, in Toronto: Catherine Wong, Tom Becker, Michael Rafferty, Gene Desfor, Roger Kiel, and Linda Peake. Also, thank you to the organisers at LIST and LISER for the opportunity to present this work at the International Symposium, The Emergence of the Smart City. Ash, J., Kitchin, R., Leszczynski (2016) Digital turn, digital geographies? Progress in Human Geography, 42(1) 25-43. Baker, T., and Temenos, C. (2015) Urban Policy Mobilities Research: Introduction to a Debate. International Journal of Urban and Regional Research. 39(4) 824-827. Bilić, P. (2018) A Critique of the Political Economy of Algorithms: A Brief History of Google’s Technological Rationality. tripleC: Communication, Capitalism & Critique 16(1) 315-331. Carr, C. (2011) Luxembourg Sustainable Spatial Development Policy: General Milestones and Circuits. Sustainlux Working Papers. University of Luxembourg, Luxembourg. Carr, C. (2014) Discourse Yes, Implementation Maybe: An Immobility and Paralysis of Sustainable Development Policy, European Planning Studies 22(9) 1824-1840. Carr, C. (2018) Sustainability in small states: Luxembourg as a post-suburban space under growth pressure in need of a cross-national sustainability. in Brinkmann, R. and Garren S. (eds) The Palgrave Handbook of Sustainability. New York: Palgrave. Hesse, M. (2105) Luxembourg. disP – The Planning Review 51(1) 54-55. Kitchin, R. (2015) Making sense of smart cities: addressing present shortcomings. Cambridge Journal of Regions, Economy and Society, 8, 131-136. Larsson, S. (2018) Algorithmic governance and the need for consumer empowerment in data-driven markets. Internet Policy Review: Journal of internet regulation. 7(2), 1-13. Marshall A. 2018. Alphabet is trying to reinvent the city, starting with Toronto. https://www.wired.com/story/google-sidewalk-labs-toronto-quayside/WIRED. Mitchell, W. (1995), City of Bits. Cambridge: MIT Press. Sidewalk Toronto (2019) Welcome to Sidewalk Toronto. https://sidewalktoronto.ca (Accessed March 6 2019). Zuboff, S. (2019) The Age of Surveillance Capitalism: The Fight for a Human Future at the New Frontier of Power. Public Affairs, New York. On March 14th at 1pm, we welcome Dr Guy Engelen (from VITO, Belgium): “Can Urban Sprawl be Halted in Flanders, Belgium? Geo-Research in Support of Spatial Planning Policy” also in the Black Box, MSH. Then in April, the Institute's next series about the Geographies of (in)justice begins, organised in partnership with the JSSJ Justice Spatiale / Spatial Justice Journal. 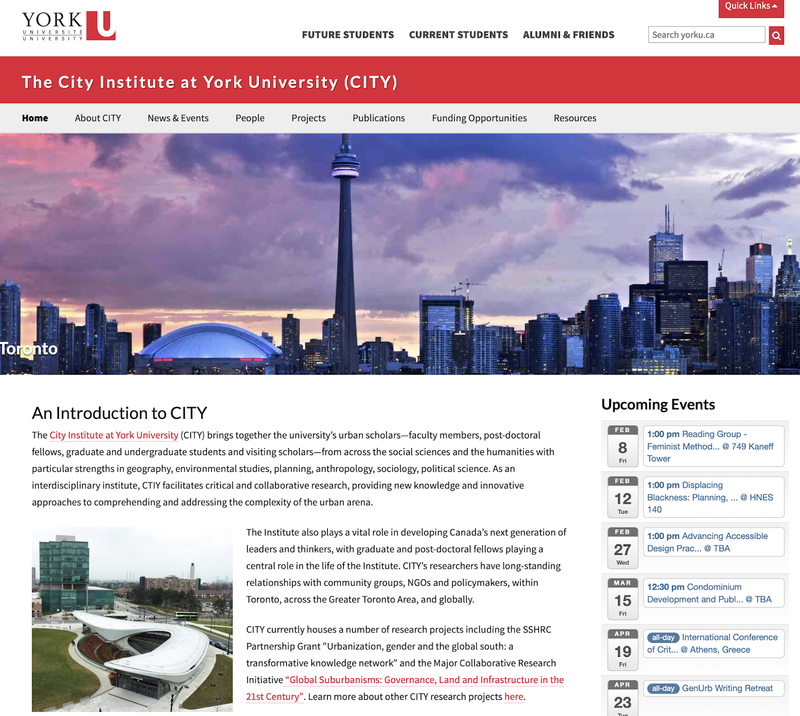 Carr, an Alum of York University's Faculty of Environmental Studies, is super excited to be joining the scholarly community at the CITY Institute, York U, as a Visiting Scholar (2019) -- an application that was generously supported by CITY members, Professors Gene Desfor, Roger Keil and Linda Peake. Inspired by constructivist and critical scholarly takes on the digital turn in urban geography, corporatization of urban governance, policy mobility, market-led land-use and sustainability, Carr's goal during her time in Toronto is to research Sidewalk Lab's involvement in urban development along the lakeshore. This topic is generating widespread international attention, and seems to hold a mine field of lessons about smart city development. Exploring this is part of a project that she is pursuing together with Markus Hesse examining the social production and governance of digital cities. It will be a great opportunity to link urban studies research at CITY to that of the Institute of Geography and Spatial Planning at Uni Luxembourg. In this spirit, Carr also looks forward to joining seminars hosted by CITY, and leading seminars on issues, such as small state governance, cross-border suburban development, critical takes on European sustainable urban development, and/or other topics related to her current or previous work. 10th International Symposium "The emergence of the Smart City: stakes, challenges, practices and impacts for public governance" organised by the Luxembourg Institute of Science and Technology (LIST) together with the Luxembourg Institute of Socio-Economic Research (LISER). This paper aims to bring forward some interweaving strands of international scholarly literature in urban geography that raise urgent questions concerning the smart city agenda. These are: 1) the digital turn in urban geography (Ash et al. 2016) and the corporatisation of urban governance and algorithmic capitalism (Bilić 2018; Fuchs 2017); and, 2) policy mobility, examining the difficulties of implementing standardized policy solutions as answers to specific urban problems (Baker/Temenos 2015; Carr 2014). Clearly, digitization and technological developments have revolutionized geography in many ways. And, broadly speaking this is nothing new. Roughly twenty years ago, triggered by the rise of the Internet, speculations forcasted that information and communication technologies would lead to the dissolution of material spaces, leaving little behind but the ‘City of Bits’, as research from the prestigious MIT suggested (Mitchell 1995). However, back then, voices were already pointing at the technological determinism of these early predictions (Graham/Marvin 2002), emphasising the complex relationship between urban development, and recalling that urban planning and technological innovation was neither totally new, nor would this relationship be so trivial that tech itself would necessarily be productive and beneficial to cities. What has changed in recent times is the proliferation of digital technologies and the diversity of applications. Following Ash et al. (2016), we contend that geography has experienced a ‘digital turn’ with urban geography being produced by, through and of digitization. And, while digitalization has provided benefits, these have also come sidelong a series of unsolved critical evaluations, which remain pertinent to current agendas on smart cities. First, there are certain epistemologies behind the production of big data, algorithms, digital technology design (Ash et al., 2016): Data is not value-free (Kitchin 2015). Rather, data are indicative of end processes of political ideologies – e.g. neoliberal urban agendas – and associated methods and processes of framing that structure the production of data. If, "we now live in a present characterized by an abundant and diverse array of spatially-enabled digital devices, platforms, applications and services that have become ordinary and expected presences in our everyday lives," (Ash et al. 2016: 28), how are these processes and algorithms informed by socio-economic inequalities and how do these technologies reproduce them? Or, how far does the corporatization of city services resemble ideologies of technological solutionism(Ash et al., 2016)? Second, the circulation of data around the globe sparks debates as to who owns and regulates the data that gets stored and processed in remote geographic locations. This, too, is not new, but scholars are increasingly wondering about the implications of data-driven markets and algorithmic governance (Bilić, 2018). There remains, “the need to examine the ownership and control of data; the integration of data within urban operating systems, control rooms, and data markets; data security and integrity; data protection and privacy, data quality and provenance and dataveillance,” (Ash et al., 2016). Third, the smart-cities agenda is being heavily pushed by companies who view digitizing urban environments as a burgeoning market for their products (Kitchin 2015). This could have a number of undesirable externalities: a) the commodification of public services, as city services are administered for private profit; b) technological lock-in effects that may render the city less resilient against bugs, viruses, crashes, and hacks; and, (c) processes of standardization that overlook specificities of places, and fixes municipal administrations to narrowly defined technocratic modes. Are we aware of these downsides? Can we manage their outcomes? Another set of relevant literatures is that on policy mobility, that focuses not specifically on the digitization of cities, but the circulation of policies. Developed as a critique of new urbanism, or business improvement districts, the central point is that urban policies are not one-size-fits-all templates that can simply be transferred from one place to another: local context and specific historical trajectories matter. This is an important message perhaps to technologists who develop their products in and for one context and then attempt to export or sell them elsewhere. It is also relevant to Luxembourg, where the specificities are rather evident. In 2017, Waterfront Toronto, a public entity in charge of managing land-use along Toronto's lakeside, announced that Sidewalk Labs – a subsidiary of Alphabet Inc.(formerly known as Google) – won the international competition to develop Quayside, a derelict piece of land wedged between Lake Ontario and an expressway. This generated a worldwide media storm, announcing that Google was getting into urban development, and rightly so. 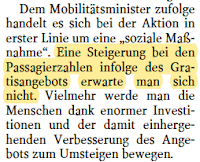 After all, why would a company that runs an annual revenue of roughly USD110 billion (Alphabet, 2017) based on “algorithm capitalism” (Fuchs 2017) get into urban development? The exact plan remains unveiled; however, Sidewalk maintains that it will develop Quayside into the best smart city ever, learning from past urban planning projects, and building improvements into the design. Quayside will be environmental with climate positive passive buildings, which will be flexible and multi-purpose. Garbage will be automatically removed, smart cars will ferry people about, and sensors will monitor air pollution. Quayside will also be social: Development will be participatory and to this end, Sidewalk has already engaged a series of Public Roundtables, Neighbourhood Meetings, Workshops, Design Jams, Kids Camps and more. Inhabitants will also profit from a system that integrates health services. Quayside claims also to aid in the economic development of Toronto, by reducing the costs of government and ensuring affordable housing (reversing the trend of gentrification otherwise sweeping the city). These pillars of sustainability will be delivered by Sidewalk’s “single digital platform” that is widely advertised but hardly explained. Certain is only that this will be a powerful data collection machine, and that the undefined governance of this data is raising red flags, displayed by several significant resignations from Waterfront Toronto and local activism (Bliss 2018; Lorinc 2018). In the light of the scholarly literature above, there is good reason for caution concerning Alphabet's promises and phantasies. Hence, our critical stance on this case. Part III Lessons for Luxembourg? What can Sidewalk Labs at Toronto Quayside teach scholars and local Luxembourgish policy-makers? First, Quayside brings into focus that Alphabet Inc.is entering urban policy as another developer on the field: It is getting territorial. (See also Amazon.com’ssearch for HQ2). In this respect, logics of market-driven land use remain unchanged. However, gaps in discourse at Quayside concerning data governance suggest hidden dimensions to this process, and perhaps even a new dimension in the digital turn: geographies forthe digital, and not the other way around. Second, as Kitchin (2015) said, smart city agendas entail the international circulation of knowledge followed by the application of standardized instruments that mismatch the specificity of place. The lessons of policy mobility are relevant, especially for the rather specific context of Luxembourg. So, we suggest that we identify the real urban problems in this country, and consider whose problems the smart-city agenda is responding to: We seek to avoid discussing a product beforeclarifying whether there is proper need. In a nutshell, based on a decade of our empirical research, the urban problems of this country are: extreme economic and population growth pressure, associated imbalances of jobs and housing (especially a lack of affordable housing), increasing transport congestion, and limited governance capacities to steer these phenomena. Most importantly, the political majority in Luxembourg believes that growth should continue. Contradictions and externalities of growth are viewed as problems of second order, and simply in need of technical fixes. Growth is almost sacrosanct and must not be criticised, even in future discourses (e.g. Rifkin). Given the absence of openurban debates in Luxembourg, the question is what benefits of smart cities bring beyond opening up new fields of tech engagement and business? We maintain that it would be beneficial to begin with an open discussion about cities first and smartness second. After developing a critical awareness of Luxembourg local development, one could then explore the nexus of cities and smartness, how the two could be brought to productive conversation, what the cost and benefits of implementation and experimentation would be. Smartness, itself, cannot guarantee better urban life. Alphabet Inc. (2017) Alphabet Announces Fourth Quarter and Fiscal Year 2017 Results. Ash, J./Kitchin, R./Leszczynski (2016) Digital turn, digital geographies? Progress in Human Geography, 25-43. Baker, T./Temenos, C. (2015) Urban Policy Mobilities Research: Introduction to a Debate. International Journal of Urban and Regional Research, 824-827. Bilić, P. (2018) A Critique of the Political Economy of Algorithms: A Brief History of Google’s Technological Rationality. tripleC: Communication, Capitalism & Critique, 315-331. Bliss, L. (2018) How Smart Should a City Be? Toronto is Finding Out. CityLab. Graham, M./Shelton, T. (2013) Geography and the future of big data, big data and the future of geography. Dialogues in Human Geography, 255-261. Graham, S./Marvin, S. (2002) Cities and Telecommunications. Routledge. Kitchin, R. (2015) Making sense of smart cities: addressing present shortcomings. Cambridge Journal of Regions, Economy and Society, 131-136. Lorinc, J. (2018) The post-Will era begins. SpacingToronto. Mitchell, W. (1995) City of Bits. MIT Press. 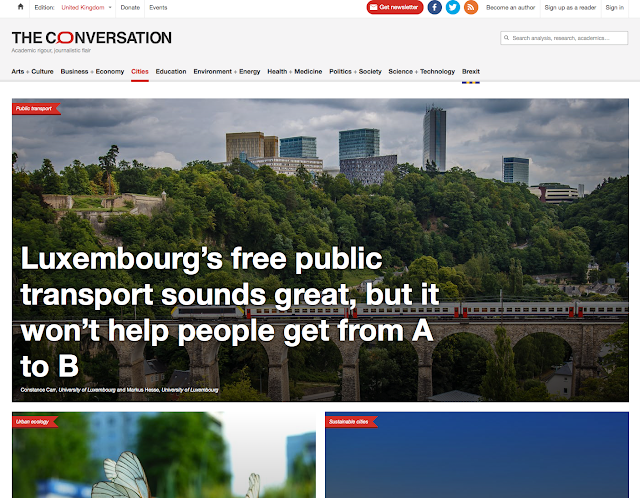 Earlier this month, we published an article in ‘The Conversation’ on Luxembourg’s decision to introduce free public transit for everybody in the spring of 2020. Shortly afterwards, the government (the Minister of Transport himself) confirmed that the measure will be effective as of March 1st, 2020 — even though there are a couple of open questions that still need clarification beforehand — and will cost about 41 million Euros annually. All the while, our article continued to generate further media coverage both locally in the Luxembourger Wort and internationally at the BBC (revealing, too, that the attention economy can shower benefits not only politicians but academics as well). In our contribution, we aimed to make two critical points: On one hand, we wanted to provide a general comment on the weakness of the free public transit measure, since we believe that it is far too over-simplified a concept given the wicked nature of the problem. Price is only one of many factors that explain, trigger, and determine modal choice. In his instructive overview, Annema (2013, 112) concluded that ‘empirical research worldwide shows … that the responsiveness to price changes is fairly modest in most cases’. Keeping a complex issue short: this means that pricing alone is not likely to spark major changes in travel behavior, and thus remains largely neutral to the overall transport system. Is it then worth such an expensive attempt? On the other hand, we mentioned three further arguments considering how free transit could be even detrimental to the health of the transport system, apart from the weaknesses mentioned before. First and foremost, there are dozens of million Euros to be spent (btw, for something that nobody asked for …) that will most likely have no visible impact systemwide. This means there is real money lost that cannot be used for more urgent measures, such as good bike networks, or a better protection of pedestrians. Second, a rush of passengers to a crappy system would disappoint many people and make them lost for alternatives to the motor car, which are actually much needed. Third, most seriously, free buses have potentials to cannibalize walking and biking (instead of reducing car travel, i.e. if the latter is not constrained…). As a consequence, such measure is neither good for the transport system, nor would it have a positive impact on the environment. It could even mean the opposite. One may also spend a few thoughts on the “social” dimension of the measure – the soundtrack with which the whole decision is now being sold to the public, as other arguments are proving less convincing. However, a social benefit could only be expected in the event that public transport fares are deepening social inequality. Unfortunately, statistical data is lacking on this issue, as transit is not included in the official consumer-price index, unlike cars or petrol. However, the factor that is most effective in creating inequalities (and also most rapidly increasing in this respect) is obviously the housing sector. So, if the government would like to undertake effective measures in combating inequality, it is rather clear what sector would come into play here. Hence, one may ask: What’s the problem? What political action is needed? Many of the points above were also the reasons behind the wide spread critical views on free transit about two years ago when it was discussed in the Grand Duchy – a discussion that included decision-makers who are now proposing the measure. Why and how have things changed since then? The answer to this question is most likely related to the policy process, and it looks as if the various ways this measure has been treated politically sheds some light on peculiar governance patterns and practices – politics “made in Luxembourg”. In this case, one could surmise the following: 1) politics prefer proposing solutions over examining ‘real’ problems; 2) it is more important to create an imaginary to sell good news, than it is to be stuck in ‘wicked’ problems; and, 3) issues are easily driven by the most powerful governance authorities from above, which in small states usually implies the central government. Concerning the first point: There is a certain tradition in this country, in terms of planning and building policy, of discussing a solution before the nature of the problem has been identified. To name these spatial planning problems that are specific to Luxembourg: It is a small but fast-growing archipelago, which brings a striking mismatch between size and function to the fore, quite visible by the unbalanced relationship between the number of residents and that of workplaces. However, taking a closer look at such real problems would necessitate proposing measures that are either overly complex or that would go against vested interests (or both). This makes the search for complex, interdependent strategies actually inconvenient for policy makers – who seek to be judged as power people who are good at implementation. In this context, professional politics seem to be more inclined to stick to PR and the symbolic. Concerning the second point: It is fantastic to see how the imaginary is circulating and changing the message! This seems to be a paradigmatic case of policy mobility, or trans-local policy. Would you like some evidence? 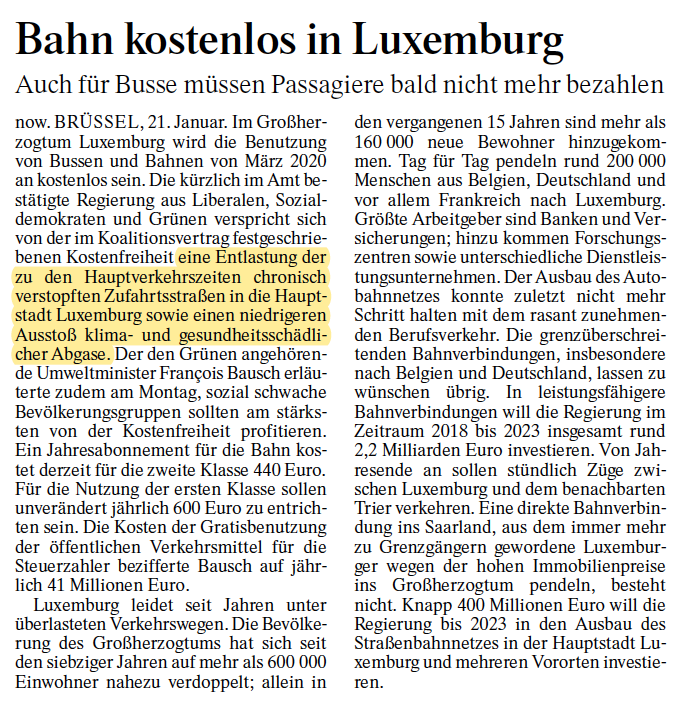 Look at what the Minister confirmed in his press conference (according to a snippet from the local Luxemburger Wort, 22nd January): “We don’t expect an increase in the number of passengers to occur. 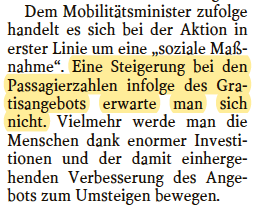 The free ride is primarily a social measure, a cherry on the cake which yet needs to be baked.” On the same day, the international press (in this case the German Frankfurter Allgemeine Zeitung, see the second snippet) confirmed another narrative: The government aims to ease congestion on commuter trunk roads and reduce transport related air pollution. These are not only two entirely different messages (in circulation), they implicate different strategies and scales of impact. The mere rise of the number of transit users is an immediate, primary, goal. Achieving such a comprehensive, system-wide result is a secondary goal and would require associated changes in other transport modes (such as mitigating the motor car and the like). So far, this is unlikely to occur. However, it can be said that the imaginary worked well, in order to spread good news about the famous country. Regarding the third point: in a press-conference, the Minister unintentionally confirmed that the nature of decision-making and governance practice in this country is primarily state-centred. When questions from the press turned to local bus services, the response was that the municipalities would, of course, remain autonomous and retain the power to choose to either continue with charging for transit use or to follow the central government’s proposal. It came out that the capital city, whose bus service is probably carrying a large portion of daily transit customers in the country, was not consulted by the government before it announced the policy scheme. To long-time observers of governance practices in the Grand Duchy, this looked like pretty common business-as-usual policy-making. The flawed and unconsidered way of decision-making does not do well in presenting the measure as well-considered. In this sense, the measure was actually rather populist (in a more critical meaning of the term), because it potentially discredits institutions and their ability to deal with genuinely complex problems. It is post-political– not in the sense that civil society would take over responsibility from institutions in charge, but given the lack of a clear, balanced but effective framework of analysis, intervention, and evaluation. However, it is not politically neutral: It is riding on the surface of media and public perception, and thus has some geo-political underpinnings (see Kȩbłowski et al. 2019). Besides ticketing details and this and that, the actual lesson to be learned from the whole story, for Luxembourg as well, is that the free ride takes the country to the screen of the international press, but does not bring us closer to a robust, appropriate strategy and practice for getting around. Annema, Jan Anne (2013): Transport resistance factors: time, money and effort. In: Van Wee, B., Annema, J.A. & Banister, D. (eds. ), The Transport System and Transport Policy, p. 101-124. Cheltenham: Edward Elgar. Kȩbłowski, W., Tuvikene, T., Pikner, T. & Jauhiainen, J. S. (2019). Towards an urban political geography of transport: Unpacking the political and scalar dynamics of fare-free public transport in Tallinn, Estonia. Environment and Planning C: Politics and Space, 2399654418821107. Hesse, M. (2018) Come, let’s watch a film and discuss cities!! The Call for Abstracts for the IGU conference to be held later this year in Luxembourg is open until the end of this month. Papers are invited to address the special topic, 'Urban geographies of the new economy, services industries and financial market places'. Our aim is to emphasise urban-regional development patterns of phenomena under the influence of economic change, digitalisation multi-level governance and sustainability imperatives. Papers are also welcome that are linked to the thematic foci of the Urban Commission! Find details in the flyer below, which is also available for download here. In mid-January, 2019, the BBC sat down with Carr to talk about the free transport policy in Luxembourg. You can read the article here. 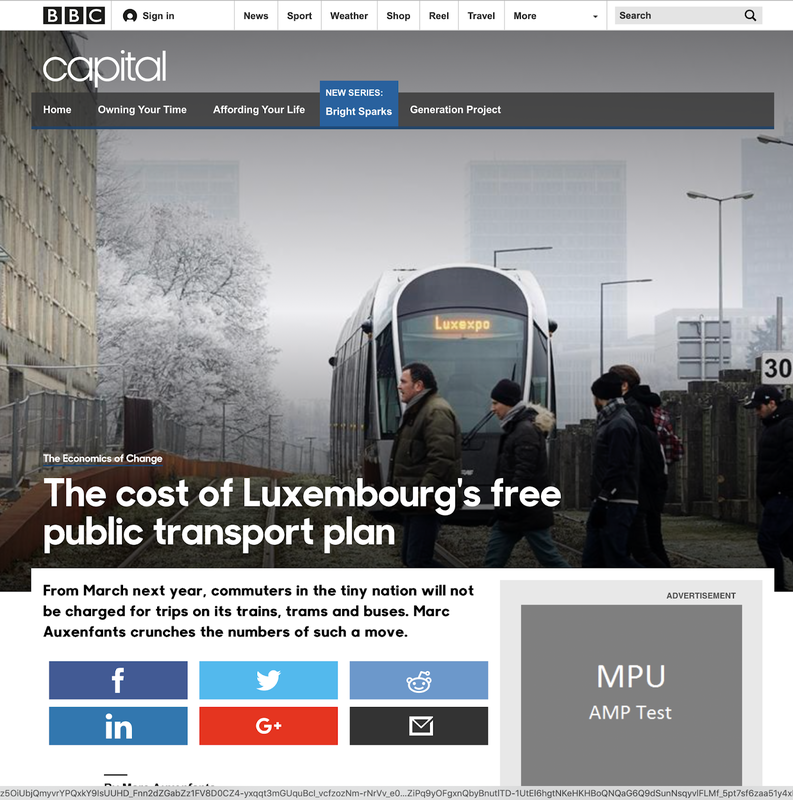 Following-up on a previous post, The post-politics of offering free transit, Carr/Hesse published Luxembourg’s free public transport sounds great, but it won’t help people get from A to B in the Cities section of The Conversation UK, January 16, 2019. The Conversation "is an independent source of news and views, sourced from the academic and research community and delivered direct to the public." All articles are authored by scholars employed at academic institutions. Articles are free to read and republish under Creative Commons licensing. Registration Open: Society for Risk Analysis (SRA) -Benelux Conference 2019: "Reasoning with Uncertainty"
Registration is now open for the 2019 SRA-E Benelux Chapter annual meeting/conference “Reasoning with Uncertainty” to be held March 25-26, 2019, at the University of Luxembourg in Luxembourg. 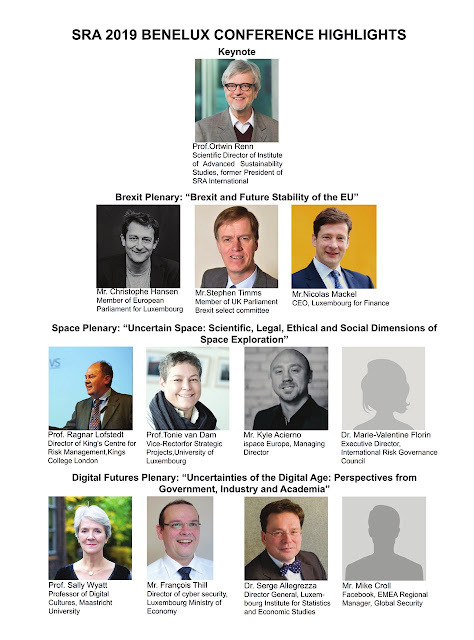 Highlights: We have an excellent lineup of high-level speakers from academia, industry and government speaking on three special panels on "Brexit and the Future Stability of the EU", "Space Exploration" and "Digital Futures". See Conference highlights for list of speakers. Registration (here) is free but mandatory. In order to be included in the participant list, please ensure that you register before 8 March 2019. CFP for session, "Housing on the edge: considerations of land and ownership, urbanization, and the possibility of recentering non-market housing" at the Deutschen Kongress für Geographie 2019, Kiel. Housing is a problem across many urban regions experiencing growth pressure. Recent patterns of development are characterized by reduced protections from negative effects of market-led land use. As the finance/management of housing was abdicated to finance-strapped municipalities, as public properties were sold/demolished, or as global financial markets capitalized on housing as an investment asset (Rolnik 2013), market-oriented forms of lodging reign supreme. All that remains is a peripheral bricolage of actors/institutions and their disparate sets of resources to address non-market housing. This condition rests on certain notions of land and property value. By seeing “property as a social institution and a set of contested practices” (Safransky 2017, 7), the assumed neutrality of market-led land use development can be questioned (Blomley 2017). Additionally, “the urban world has fundamentally changed [… with] a wide range of urbanisation processes […] generating a multitude of urban outcomes, resulting in differentiated, complex and often surprising urban landscapes,” (Schmid et al. 2018). There are comparative dimensions to consider: just as urban space is changing, so too are housing/land problems/solutions. Approaches to housing aiming to mitigate market-led development cannot be one-size-fits-all: context matters. To open up this conversation, we aim for a session (EN/DE) comprised of 15-minute presentations followed by brief discussions. We welcome abstract proposals addressing non-market housing and the land question against the background of new and changing social spatial urban imaginaries. Topics may include (but are not limited to): institutionalist readings of urban growth pressure/planning/non-market housing, and discursive constructions of value/scarcity, comparative analyses, and related considerations of housing and periphery. To submit to this session (Fachsitzung: L8-FS-201), please select the session number provided by the pull-down menu on the online form. Each contribution can have a maximum of two authors. The online form will ask that you please include a title of maximum 160 characters, a short abstract (max. 200 characters) to be published in the program, and a longer abstract 'exposé' (max. 2500 characters) for the conference website. Accepted papers will be confirmed by March 25th. In a blog entry posted earlier this year, we provided some background information on, and context to, the mobility quandaries that are associated with Luxembourg’s new Science City and Belval Campus. Since then, nothing has actually improved. In fact, things have gotten even worse, given the various road blockings, construction projects, and general transit chaos organised by the set of transit infrastructure providers in the area. All of this renders the seamless journey into and out of Belval even more difficult than before. On that note, and more as a joke, we also referred to some of the fantasies that were circulating during the summer election campaigns, where some political parties were promising free public transit across the entire country should they win the national election in mid-October. Now, after the new coalition government comprising the blue (right liberals), red (apparent socialist) and (light) green governing parties has agreed upon a new agenda for the coming five years, and the ministers have been sworn in, it’s all there: Free transit will be introduced across the whole country by some time in 2020. The news on this decision then spread across the planet, with massive media coverage in outlets such as the Guardian’s international edition, the New York Times, the BBC, Forbes, Time Magazine, other broadcasts across Europe, North America, Asia, and Australia, and in different languages. The news even reached Bernie Sanders who congratulated the Grand Duchy on its (apparent) accomplishment, which has already received 13,000 likes on facebook. Yet, the perception of free transit is as divided as the view on our shiny new Belval Campus: While visitors from abroad are struck by the architecture and the urban design, those who have to commute to Belval and inhabit the offices for work every day have a different view. In the light of the cold and windy setting of the urban fabric that lacks green space, offers overpriced commercial outlets, and leaves little to nothing for people to self-organise (Gaart Belval remains one of the few examples), the pre-fab character of the site is only topped by the building, property, and infrastructure management that usually appears rigid, random, and not particularly devoted to users needs. Likewise, that Luxembourg should receive such vast international (not domestic) praise as the second country (not the first!) worldwide after Estonia to implement free public transit nationwide is rather irritating to those who are actually using the system on a daily basis. A small reminder here as well: Luxembourg is, indeed, a country, but it is also a de facto city-state, whose urban agglomeration spans three borders. Admiration of its nation-wide free transit as if this were any kind of beacon to other countries around the world is thus blown entirely out of proportion. But more to the point, fees are clearly not the problem – not in an admittedly small (and wealthy) country where you can travel from the Belgian to the German border for just 2 Euros, buy a daily ticket for 4 Euros, or invest in a subsidised annual pass for less than 200 Euros (which many of us are using). The problem lies in the recent socio-economic evolution of Luxembourg, in its structural framework conditions, and in the state of transit provision which an evaluation of 'poor' would actually be rather generous. These issues were already outlined in an earlier blog-post last June, so there is no need to be overly repetitive. However, in a nutshell there are three factors that come into play here. Firstly, there is the rapid growth of the country that has recently added 100,000 people to its population every eight years, while annual GDP growth has steadied at 2-4% for some time now. Secondly, many infrastructures (including roads, rail tracks, stations and rolling materials) are already in a critical state, meaning that catching up with these growth rates is almost impossible to achieve. Thirdly, it is the path dependant, old-school organisation of transit provision and the really poor customer dedication that make the daily commute definitely not fun (which might be too high an expectation). Effectively, it is a mess, very slow, and completely unreliable. In the light of these deficiencies, should we really care about fees? No, of course not. What will happen when transit will be offered for zero? Here, the public transit system will quite likely become even more crowded and dysfunctional. And, as soon as the free riders notice that it doesn’t work, they will be lost for change. Many will decide instead to get into their cars, because they are simply faster and more reliable. Those who can't afford, are unable, or are simply not a fan of driving, will be punished further. Free transit also tells a delicate political story, in two parts. 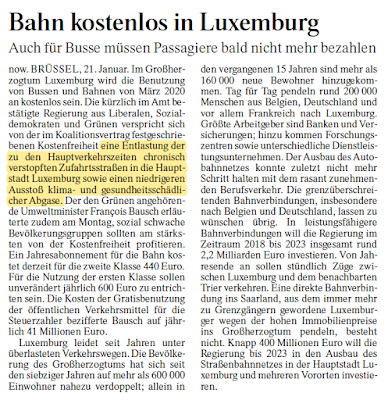 Firstly, the 40-60 million Euros per annum that will need to be compensated by tax-payers will also be collected from cross-border commuters, who, by the same token, won’t benefit significantly from the last penny-free mile into or out of Luxembourg. More crowded trains and buses will make their journey even more difficult. Thus, the society’s divide between foreign and autochthon might only be further reinforced. Secondly, it is no coincidence that the idea was not born of the (green) transport minister – who is against it, as his party is as well. Suspiciously enough, the proposal came from the Prime Minister, whose political party has the least affiliation to public services, rail and transit across the political spectrum: The right-wing liberals. And, they probably just weren’t aware what they were doing. One can assume that they have little experience with the local trains and busses, because one might otherwise expect a more convincing set of proposals to improve the system as a whole. However, this would necessarily mean going against the vested interests of automobilists, a risk that liberals are never prone to take. (Also, on a more non-scientific note, it is curious that the announcement of free transit came alongside the legalization of cannabis, which was proposed by the same government accord: Is there a reason that the two are brought together?). So, free transit in Luxembourg is not a recipe that others ought to copy and follow. It can run a system to its death that is already beyond its limits, thus revealing that the priorities set in the political realm are more or less going wrong. And, the verve with which Luxembourgers now appreciate the global media attention that their small country has received triggered by the free transit ticket, provides a further indication that this idea was, from the very beginning, not conceived of in order to solve real-world problems. It was a political stunt whose purpose was purely about media coverage and PR – a sort of, “mobilities of nation branding,” if you want. From this perspective, it was a brilliant stroke. This impression coincides perfectly with a recent reading of Crystel Legacy’s (University of Melbourne) nice paper on ‘The post-politics of transport: Establishing a new meeting ground for transport politics,’ published in 2017, in the Australian Geographical Research. By referring to the earlier works of scholars who observed a drying out of the political caused by managerial policy-making, she addresses post-political governance environments described as ‘a situation in which the political– understood as a space of contestation and agonistic engagement– is increasingly colonised by politics– understood as technocratic mechanisms and consensual procedures that operate within an unquestioned framework of representative democracy, free market economics, and cosmopolitan liberalism’ (Wilson & Swyngedouw, 2015, p.6). In such contexts, free transit is nothing more than a post-political pill that pretends to do good and is easily sold to the rest of the globe, while all the wicked, real world problems of getting from point A to B and back again remain unsolved. Reacting to the international media that has praised and fawned over Luxembourg in the past couple of days: i) the framework conditions in the Grand Duchy and the Greater Region urban agglomeration are really challenging; ii) the current state of the public transit system is the backlash of three decades of ignorance and non-action in the transport and infrastructure domains; and last but not least iii) the addiction to the motor car that makes small but powerful Luxembourg look increasingly like SUV-country is far from overcome. Free transit will not lead to improvements in terms of functionality or sustainability. And, if the price is not the problem, then the rest must be tackled first. But this less appealing bitter pill, would neither make the headlines nor place the country spotlight of the global media. - The Grand Duchy of Luxembourg receives a daily influx of 192k cross-border commuters from the border regions of Germany, France, and Belgium. Carr. C. (2013) Discourse Yes, Implementation Maybe: an Immobility and Paralysis of Sustainable Development Policy. European Planning Studies. 22(9), 1824-1840.